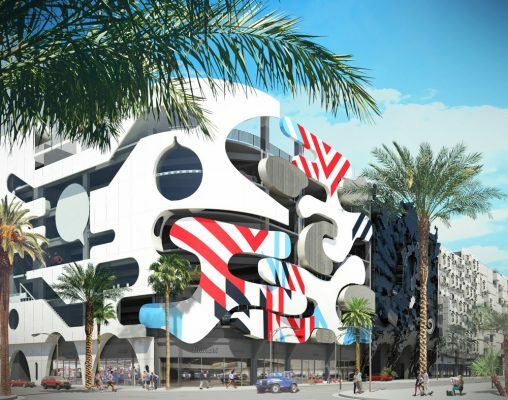 The Miami Design District, a neighborhood dedicated to innovative art, design and architecture, has commissioned The Museum Garage to be built as part of its Phase III development. It is a seven-story mixed-use structure with ground-floor retail and the capacity for 800 vehicles. Curated by Terence Riley of K/R (Keenen/Riley), the project will feature five dramatically different façades by WORKac, J.MAYER.H, Clavel Arquitectos, Nicolas Buffe and K/R (Keenen/Riley). 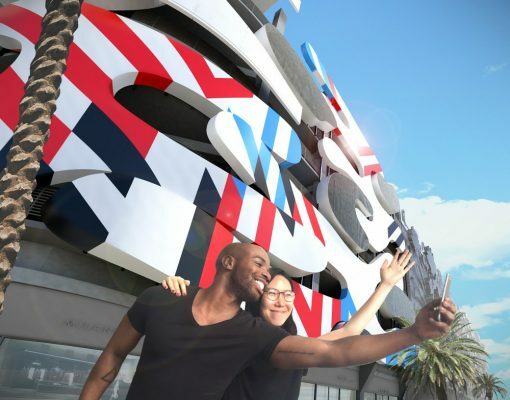 The building will also feature a mural by Sagmeister & Walsh. J.MAYER.H’s design concept starts from two approaches. The idea of adjacencies and mediation translates the voids or negative spaces by WORKac on the left into positive volumetric echoes. 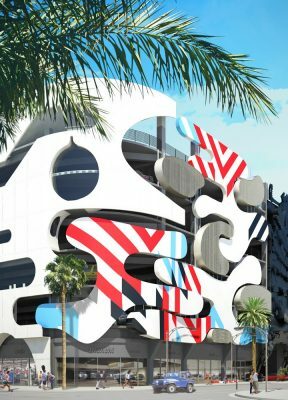 The red and white striped traffic pattern of K/R Architects from the other far end of the garage façade finds referential graphics on J.MAYER.H’s design. While the idea of puzzling and interlocking is shown in the relationship designed on the left side with WORKac, the right edge of the façade segment is cut off with a straight vertical line analogue to all the other segments of the overall façade. 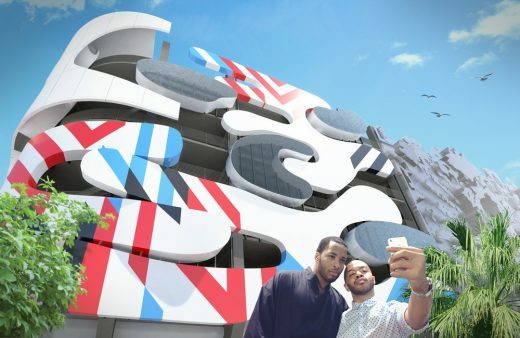 The façade will be built in steel and aluminum, and painted in different colors. It contains embedded lighting that glows at night. 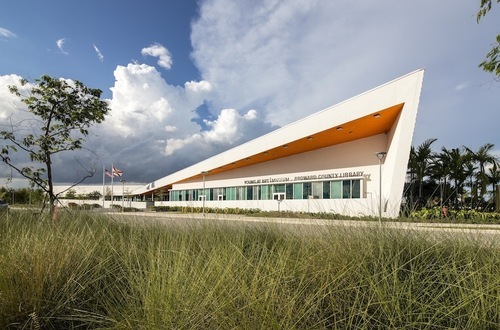 Infrastructures and car spaces are rarely seen as architectural projects. In the context of the Design District, the “Museum Garage” becomes an urban component including commercial space on street level. Cars and the speed with which they move through the city cause the urban dimensions for pedestrians to overlap with the perception of urban dimensionality. The façades of large building volumes in such an urban context demand variety and differentiation. The concept of various architects working on different segments of one building envelope is an exciting innovative design strategy to explore collaboration, adjacencies and cross-referencing. Design: Paul Cremoux W. / Manuel Angel Bugallo O.